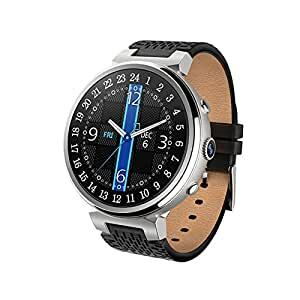 ãInnovative Light-Smart Watchã Ware it as classical watch (5ATM waterproof, 316 stainless steel or leather straps ) for daily use, meanwhile combined innovative smart functions for daily activity and healthy tracing or monitor. This magic watch with Holographic Projecting Screen, which normally remains transparent and will display when you check the smart datas. Give you brand-new experience of Light-Smart Watch. 3 colors are available for your stylish choice. ã2 days charging 7 days workingãNo More Frequent Charing, with integrated battery for both smart and watch functions, 2 hours charging time, 40 days’ long working time for smart function, 7days’ working time for digital movement, and convenient to be charged by innovative charging pad. Say good to daily charging as common smartwatch. ãConvenient to Useã Bluetooth 4.0 technology, easy to compair with all Android & IOS Smartphones in seconds. Timely syncs the incoming calls , SMS , app notifications push ( like Facebook , Twitter , WhatsApp and Skype ). You will never miss any important information of your friends or social media. Camera Remote Control Function on APP can set your hand free when taking photo with your friends. ãDaily Activity TrackãPedometer to track your everyday accomplishments: steps, distance and calories burned. With sleeping monitor and sedentary reminder to daily healthy. APP will record and manage all your datas, help you achieve your daily exercising goals. Hate to charge your smartwatch frequently everyday or just several hours? Want a wareable beautiful watch which can meet your style, meanwhile has smart functions for daily or sports activity tracing and healthy monitor? Light-Smart Watch is your best choice. DSMART is an innovative and leading brand who focus on developing Light-Smart Watches. It is the new generation of watch which combined and integrated the up-to-date and innovative smart technologies into tradional mechanical,quartz or digital watches. So it still has elegant,beautiful appearance as tradition watch, meantime with up-to-date smart functions such as heart rate monitor, pedometer, gps etc. And with the advanced Energy-saving technology, the Light-smart watch can work for much more longer than common smartwatch. Say goodbye to frequent charging! Please search “DSMART” for more details, welcome to experience the new generation of smart watch.